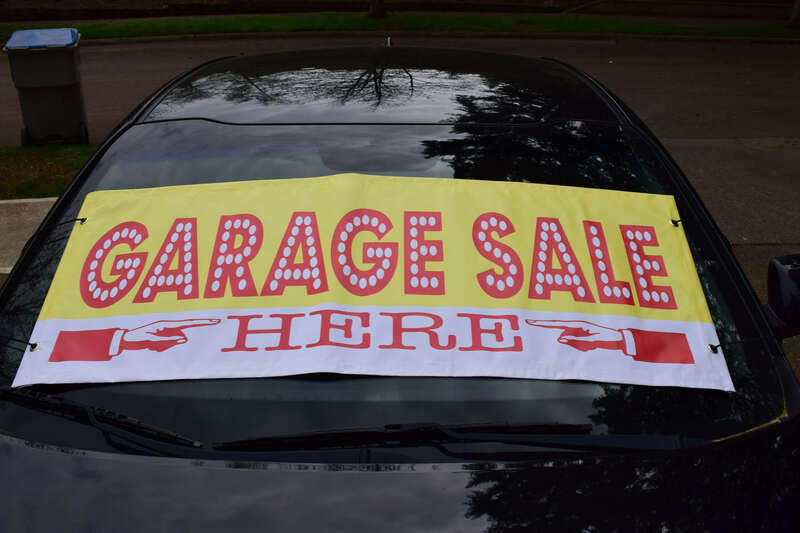 This bold garage sale sign windshield banner stands out with its red, white, and yellow colors to generate more interest for your garage sale, leading to more visitors and more sales. The Garage Sale Sign Windshield Banner comes in one version with Red, Yellow, and White colors. If you’re holding a garage sale, you want to make sure everyone knows about it. Put up one of these windshield banners and you’ll get a lot more attention. The large, bold letters are eye-catching so no one will miss your big sale, helping you to make it a success. Made from vinyl, the banner is durable and weatherproof. Fix it up in any weather, and it is easy to put up and take down again using the elastic bands. Attach it to any windshield, and advertise your event whatever the weather. This garage sale sign is the best way to advertise your garage sale and make sure more people come along. We have a large range of banners including Open House Banners and Custom Windshield Banners. Or take a look at our Custom Real Estate Flags and Mini 3D Real Estate Flags. Whatever your event, make sure you get noticed! We make sure we send out all orders ASAP, so you can expect to receive your Garage Sale Windshield Banner in 1-5 days from the date of purchase.